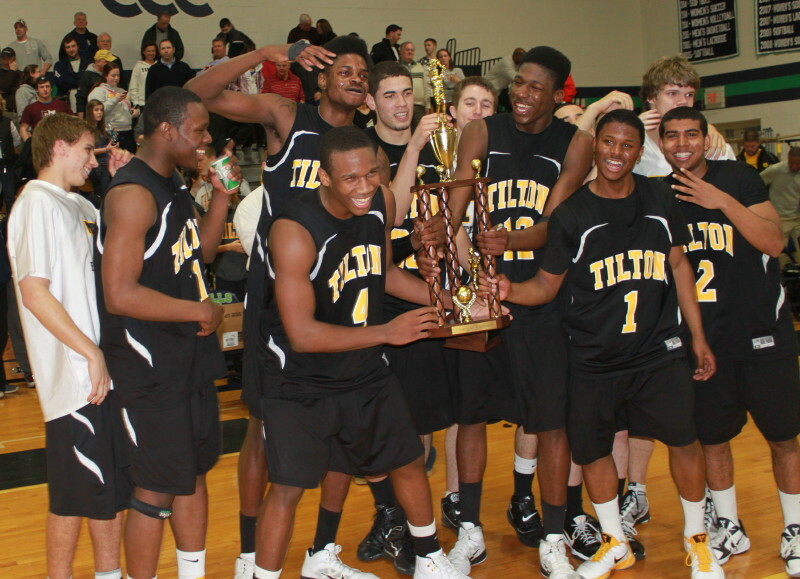 Wayne Selden (#4) and Georges Niang signal the number of consecutive Tilton Class AA championships. 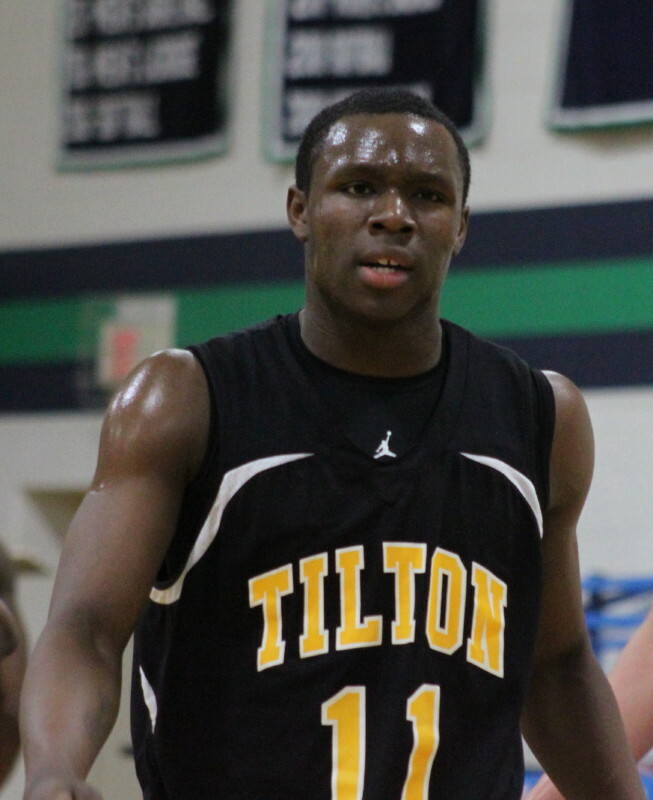 (Beverly) That’s four straight NEPSAC Class AA championships for Tilton School. The Rams (25-4) put consecutive points together at the end of both halves and defeated St. Mark’s, 72-56, at Endicott College on Sunday afternoon. 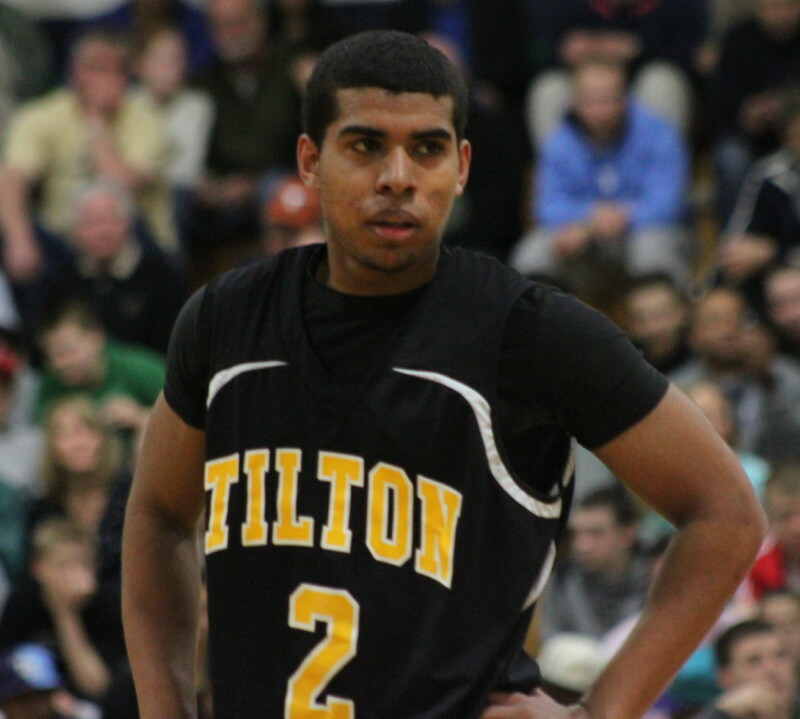 Tilton specialized in high-percentage shots all afternoon. Of their thirty-one baskets, eight were dunks and sixteen were layups. They came away shooting an incredible 63%! Of course the dunk is the best of the high percentage shots and the Rams had four different players (Nerlens Noel, Wayne Selden, Goodluck Okonoboh, and Georges Niang) excite the crowd with jams of various styles. Wayne got his 3rd in the last minute of play and it put an exclamation point on the victory. 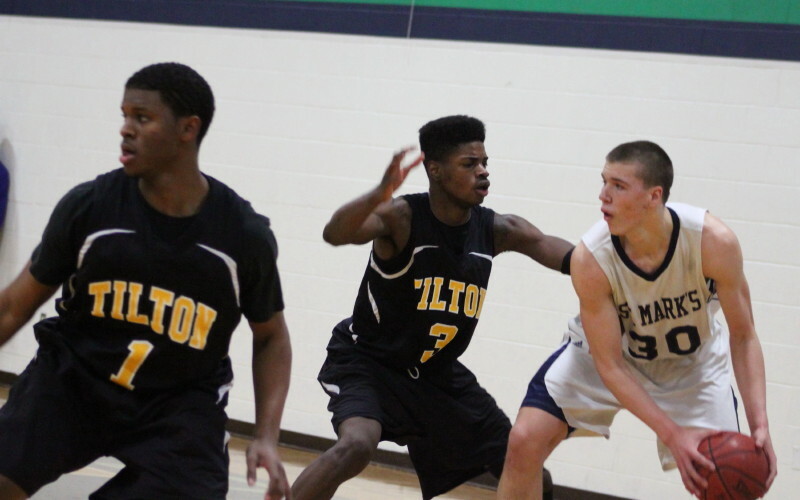 6’11” sophomore Nerlens Noel (#3) defends 7-foot junior Kaleb Tarczewski (#30). 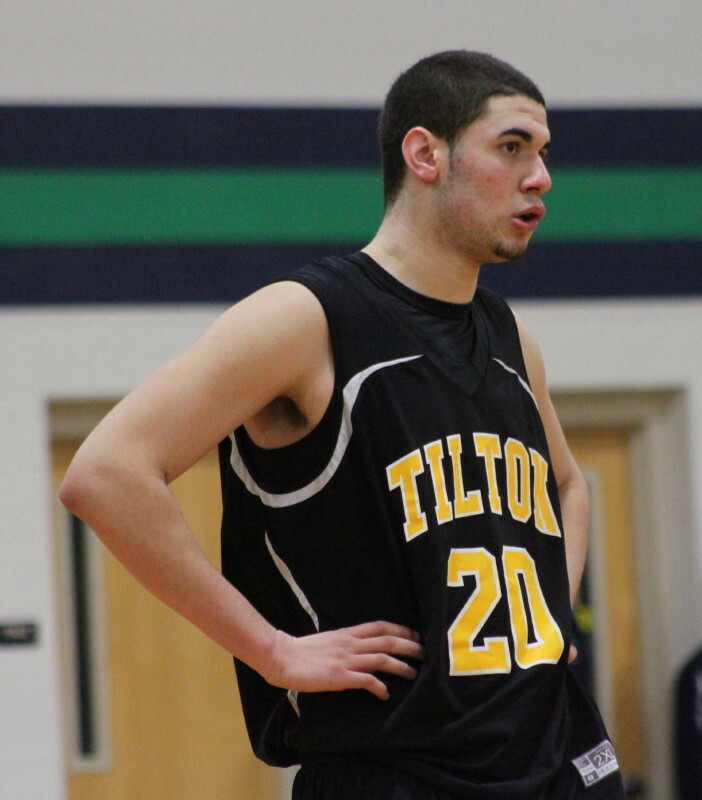 St. Mark’s (28-3) had won sixteen straight but couldn’t match the finishers Tilton had, although the Lions had four dunks as Kaleb Tarczewski got three and Nick Stauskas one. Nick led the Lion scorers with seventeen points and Kaleb followed with twelve. 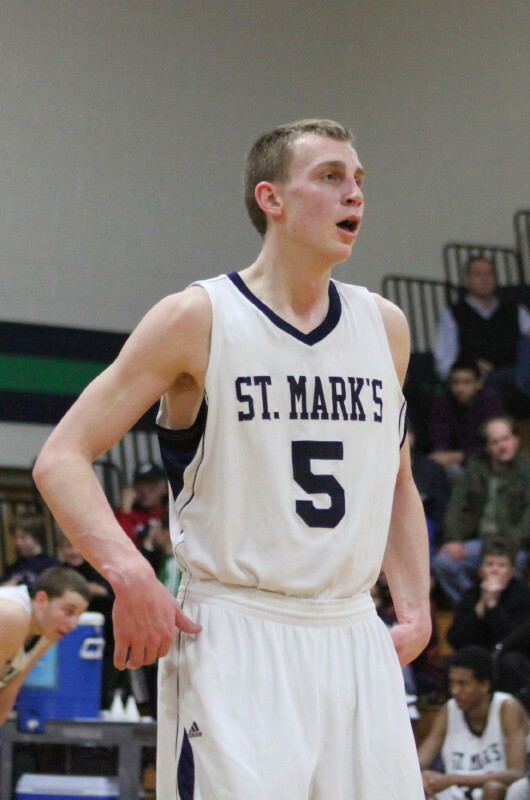 The why-did-they-lose stat for St. Mark’s was their 25 turnovers. 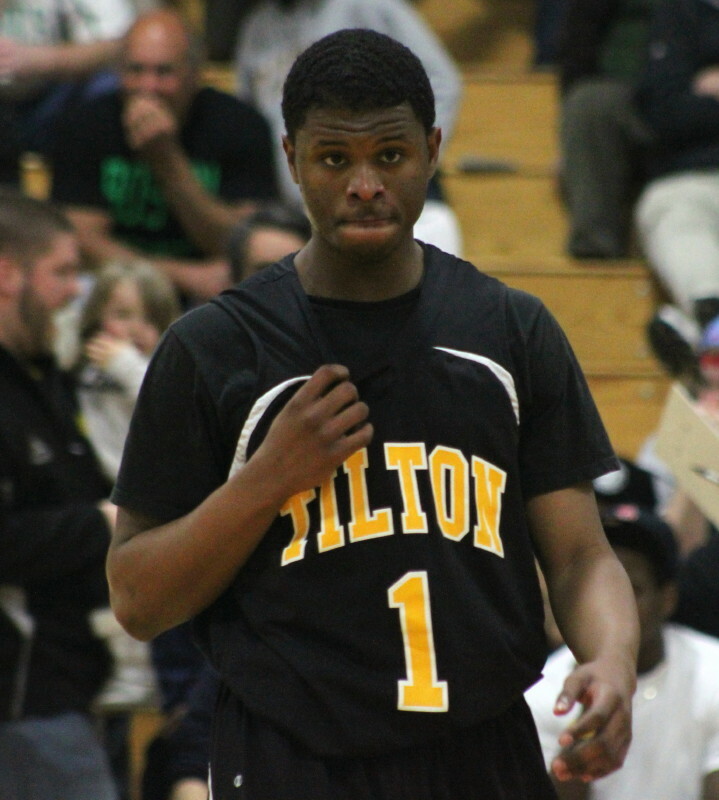 Not only was Tilton tough on the inside on the offensive end but also defending around the basket down the other end. Tourney MVP (Georges Niang) collected 23 points while freshman Wayne Selden added 22 points. I mentioned “consecutive points” earlier. In the last 2 ½ minutes of the first half the Rams held St. Mark’s scoreless and ran seven straight (Georges’ 3, Nerlens dunk, and Tony Lester layup) to lead at the half, 36-24. The Lions cut into that lead a couple of times (46-39, 56-49, and 59-53) in the second half but never got closer. The Rams sealed this one with a terrific final 3 ½ minutes. As St. Mark’s came up with seven straight empty possessions including three turnover, the winners ran eleven unanswered points ending on Wayne’s dunk to win the championship going away. I was disappointed by what I saw of Duke-bound Alex Murphy. 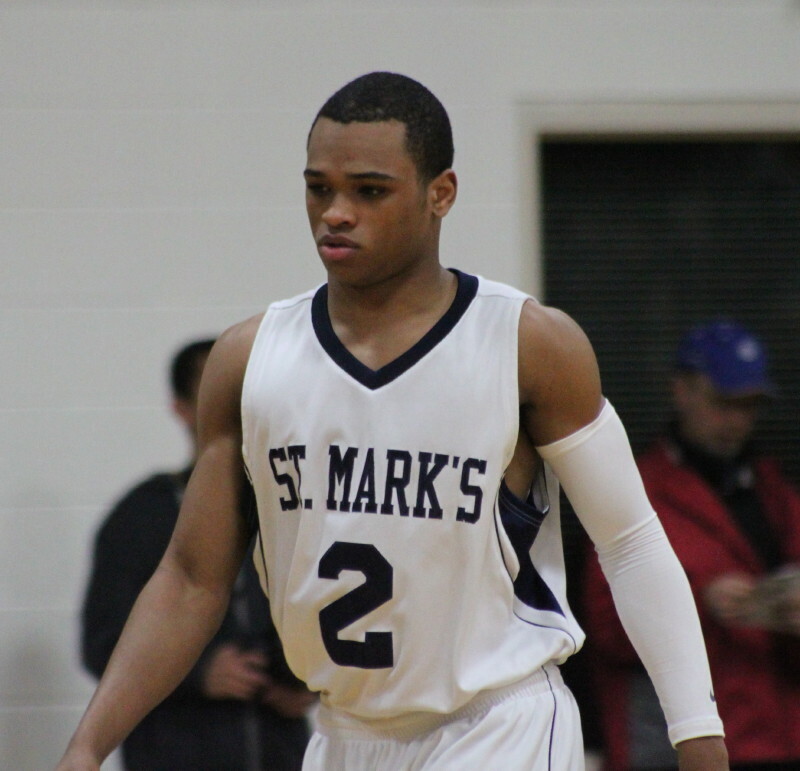 He collected only eight points for St. Mark’s and probably had at least five turnovers around the basket. His rebounding was solid. He could stay away from Duke for a year, because he’s a junior, but there is talk of his going there after this season. He’ll be making a big mistake if he does based on what I saw today. 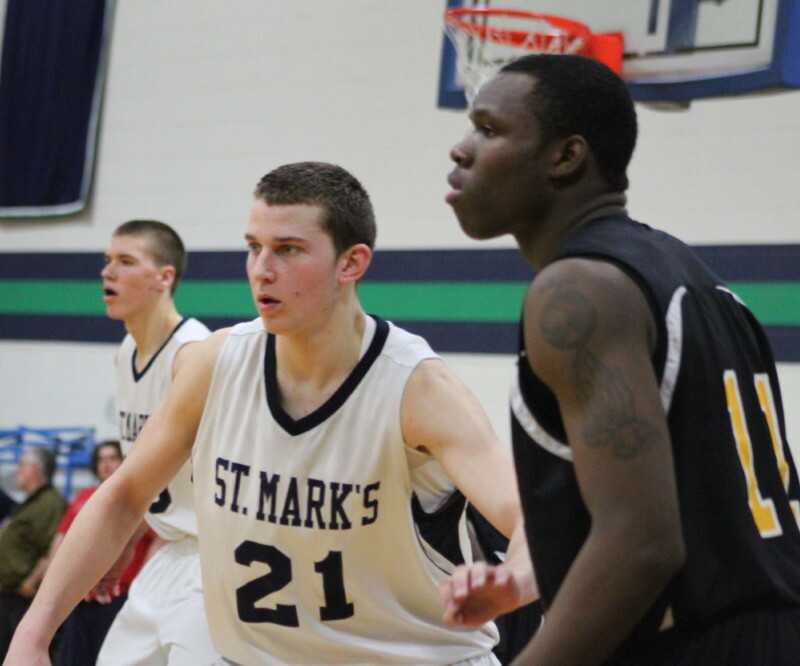 Nick Stauskas (#21) led St. Mark’s scorers with seventeen points. It was my good fortune to sit next to Nick Stauskas’ dad during the game. He explained how Nick got to St. Mark’s (from Toronto, Canada) and told me of some of the colleges (Iowa, Michigan) showing interest in the 6’6” junior. I asked him what his son does in the off-season and he laughed informing me that there is no off-season. 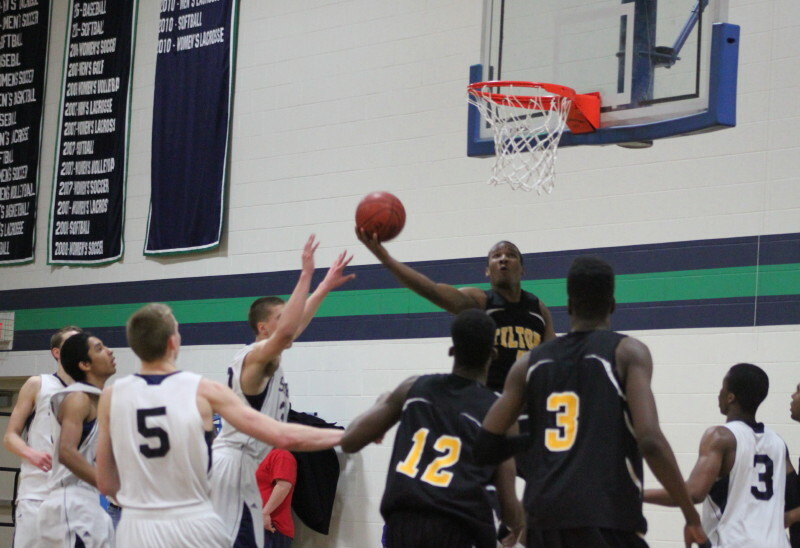 It interests me to see that more and more people attending the NEPSAC tournament each year. It is an early chance to look at some terrific athletes. Some of them, like Andre Blatche, reach the pro level. I had a chance to talk with Joe Mussachia from Manchester-Essex about the Hornets big win over Matignon in the Division 4 North quarter finals on Saturday night.